You ever get the feeling that people celebrate wherever you go? I’m not talking about people smiling when you announce you’re leaving – I get that a lot. But I’m talking about thousands of people coming together with you in a celebration of you being there. Well it feels that way whenever I’m in Munich. I’ve been here before, as you may recall. 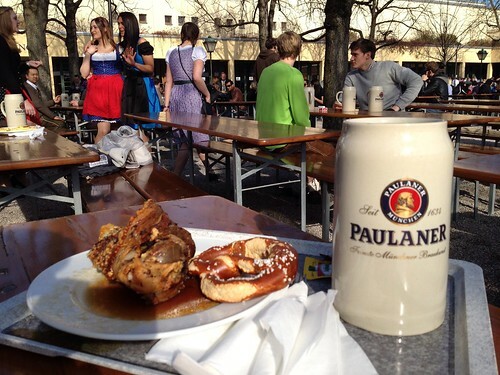 On my mystery trip I ended up in Munich for Oktoberfest. Now I’m not claiming that Oktoberfest was just for me. Clearly that’s not the case. But it did kinda lose some of its oomph (but not it’s oompapa) when I left. Or so I hear. Now I’m back in Munich and come to find out there is another beerfest coinciding with my arrival. The Starkbierfest or Strong Beer Festival, is to be held the weekend I’m here at the Paulaner am Nockherberg Brewery, just a stones throw from town. These are semi regular events but I highly suspect that they plan them around the schedules of visiting dignitaries and soon-to-be-legends like myself. So I walked along Fraunhoferstraße which turns into Ohlmüllerstraße across the river on the way to the festival. It’s a pretty cool street. Record shops. Antique shops. Place to get what look like real dirndls. 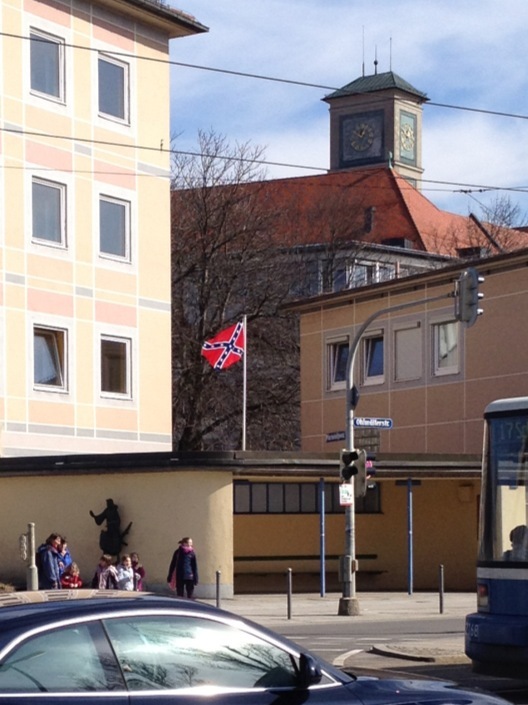 But why is there a Confederate Battle Flag? Went in to the festival – a combination outdoor and indoor venue. First thing I did was went and got a maß (literally “measure” but use here for a liter) of Salvator, a schweinefleisch haxe (which is like a pigs knee or something) and a bretzel and dug in. The haxe was interesting – seasoned with rye an deep fried so the outside was crispy and tasted like a pork rind (which it is) but fairly dry inside despite being full of fat. Tasted great though. When it started getting dark and cooling down I went inside the festhalle and accidentally sat next to 3 Americans who are here working at a hotel on a military base. They’re students studying hotel management at the University of Oklahoma. On my other side was a group of Germans. It was one of their birthdays. The guy would randomly look over and loudly sing “I’m proud to be an American! And I’m proud to know I’m free!” It was so funny I didn’t correct him but let him just go on butchering Lee Greenwood for hours. After a while of that we all split up an I headed up to near the front where the band was playing and where a lot of volks were singing and dancing. Every once in a while the band would strike up an English song like Country Roads and I would belt out the lyrics like the rest of them. I left as they were shutting the place down, having thoroughly exhausted myself on singing, dancing and drink. The event was definitely reminiscent of Oktoberfest and I guess most Bavarian beer fests would be the same.